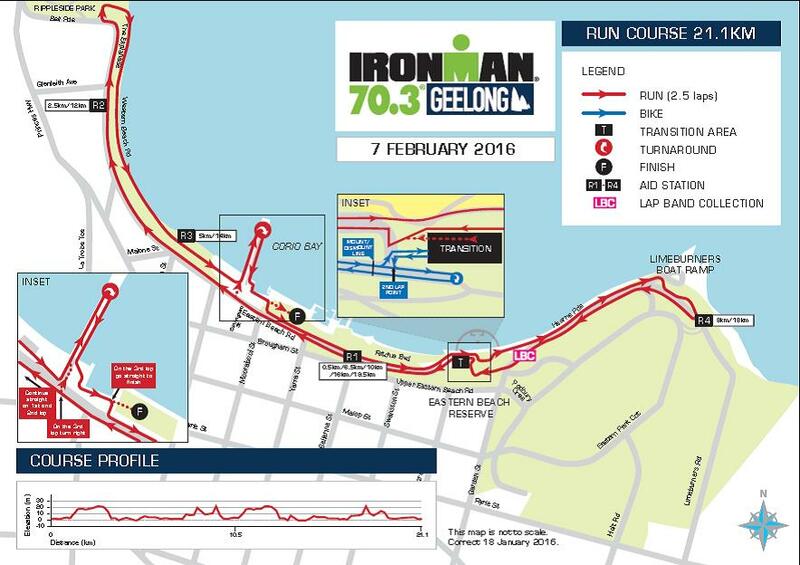 The swim, bike and run courses have all changed for the 2016 edition the Geelong Ironman 70.3 race. The bike course's major changes comes in the first few km's using Hearne Pde and heading clockwise on the Eastern Park Circuit and some extension to the turnaround points on Point Henry and Portarlington Rd. The course changes for the run will see competitors run along the waterfront for the duration of the final leg with slightly less hills. All in all the changes make for safer and more flowing course and Race Director Adam Renn should be congratulated for this. A wide starting area and ample swimming room to the first turn. Possible sun glare along the 700m stretch from the first to the second turning buoy. Generally a sheltered course from the elements. Little has changed from last year's edition except you now swim 800m to the first turning buoy instead of 850m, and 700m to the second instead of 650m. Conditions are normally very good in sheltered Corio Bay with water visibility excellent. The start is wide and its a long straight drag to the first turn, so if you are a nervous swimmer there is plenty of time to hit your swimming rhythm. There will be guide buoys along the course between each major turning buoy so its easy to hold your line. 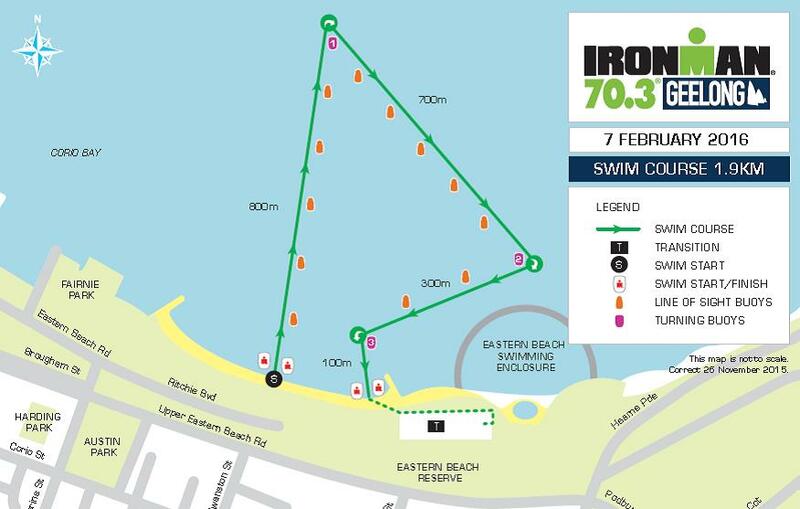 Once you turn 800m in, you will have 700m to the next turn in a south easterly direction. If it is sunny you will encounter some sun glare along this stretch. My tip, use the outer edge of the swimming enclosure to sight and head just to the left of it to stay on track if its a sunny day. From there it is a turn to the right for a further 300m to the final buoy. This is where a lot of competitors will accelerate so stay aware if you have a nice sit on someones feet and want to maintain it. Final turn will see a 100m drag into the beach. There is a very gradual gradient to the shore at Eastern Beach and you will encounter some sea grass in the final stages. The best advice would be to swim until your pull through hits the sand, then its time to stand up and wade out of the water. The run up the beach and along the full length of the transition area is quite long, so you will have plenty of time to get the wetsuit to your waist, so no need to rush this. Athletes will enter at the rear of transition which is fully grassed and run along the racks to your bike rack position. Think about your strategy of getting your feet in your shoes out of T1, as there is a hill 400m into the bike up Eastern beach, so feet need to be secured into your bike shoes by the start of the climb. Be very careful on the corner exiting the Eastern Park circuit a few km's into the ride, its sharp and you will hit it at speed coming off a down hill. The wind if any will likely be a cross headwind from the right shoulder on the way out along Portarlington Rd, and you will cop a headwind returning from the Point Henry turnaround, so pace you initial stages of each lap of the ride if its a windy day. When coming off Portarlington Road and entering Holt St near the end of the lap, slow down. It can be easy to over shoot the corner, which is not good with riders coming the other way on a tight corner. There are a few changes to the bike course this year. After climbing the Eastern beach hill 400m out of transition, one of the changes is competitors now turn left onto Hearne Pde staying on the right hand side of the road, until you climb a short hill of 200m before connecting onto the Eastern Park Circuit. As mentioned be careful at the end of this descent as there is a sharp left turn into Holt St at the bottom of the hill which you come into at speed. From there you turn left again onto Portarlington Rd and head east for 4kms along a flat section. Any wind will likely be a cross head wind over your right shoulder (southerly) and this will be the case all the way out along Portarlington Rd. After 4kms athletes turn left onto Point Henry Rd and head out along a dog leg left to Gate 5 of the Alcoa Plant for 5kms before turning around and heading back along the same road. This area is flat and exposed with salt flats on the left and the road can tend to have a patchy surface in areas. From there you turn left back onto Portarlington Rd. The main hill on the course is a further 4kms along, its about 800m at 4-5%gradient, so stay within yourself up this ascent so you are able to maintain your intensity over the crest without the need for recovery. From here there is a further 6kms of fairly fast slightly rolling roads before the far u-turn at the Curlewis Golf Course. Athletes then turn around and head back for 18kms along Portarlington Rd. Any wind will be behind along this stretch so expect a fast return. Once competitors reach Holt St they keep heading straight for a few hundred meters before a u-turn where they head back to the left turn into Holt St. Remember to watch your speed into the left turn as athletes are coming off a downhill and will be turning into a 2way road with riders coming the other way and this corner can easily be overshot. Caution is required on this turn. Turn right into Eastern Park Circuit, up the climb and veer left staying on the circuit till a right turn into Podbury Crescent. Then athletes are down Eastern Beach with a sharp 180degree u-turn into Richie BLVD. Please again watch speed on this corner as it is sharp and can catch you out. One is at the corner of Portarlington and Wilsons Rd at 5km and 50km in, and the other is at the corner of Portarlington and Hermsley Rd at 26km & 70km in. Bike aide stations will offer water, Endura electrolyte – pineapple flavour, Winners gels, Winners bars, vaseline (situated in toilets), ice, sunscreen, insect repellent and toilets. A challenging bike course with something for everyone, the 2016 changes to the course only make it more enjoyable and safer for all athletes. Pace your ride, watch your intensity on the climbs and build as you go. The run course has been altered, which will see slightly less hills on each lap with the omission of the Eastern Park Loop section. There are still four punchy climbs on the course to take note of though; the gradual climb running north along the Esplanade, the climb onto Hearne Pde once you pass the swim enclosure and two climbs at each end of Hearne Pde. The course has been extended on the northern side, right up to Rippleside Park at the end of the Esplanade. 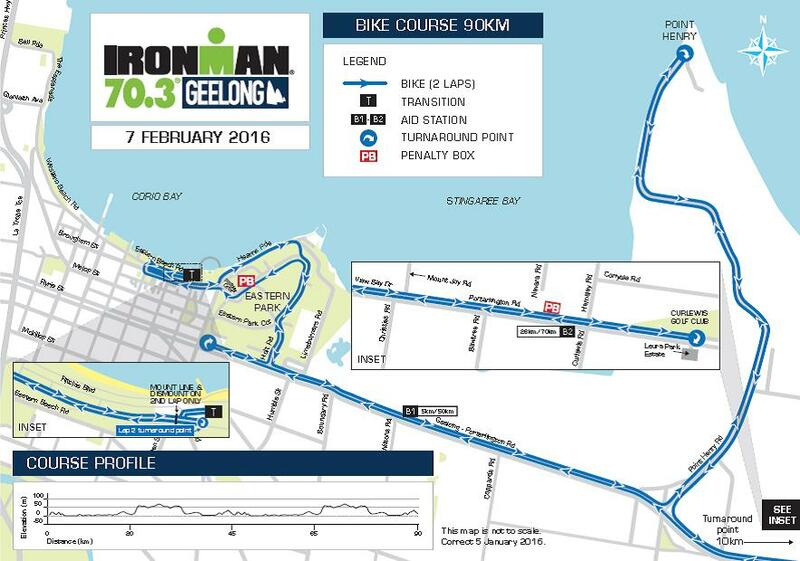 On each lap competitors will also run out and back along the length of the Geelong Pier, and will run an extra section at the end of lap two including the pier before turning to come up the finishers chute. As a result competitors will be running along the water line for the duration of the run leg. This will add to the spectacle for competitors and supports alike. From transition, competitors first head north past the Ferris Wheel and the finish line and up the gradual climb along Western Beach and the Esplanade, which will be a test for competitors not yet into their run rhythm. The course takes the competitors right to the end of the Esplanade where they enter Ripples Park and run behind and around the restaurant, before heading back along the boardwalk and shoreline. This 2km section is relatively flat and will help competitors settle into a steady pace. From there there is a left turn and a run along the left side of the pier, and back along the tunnel on the right. 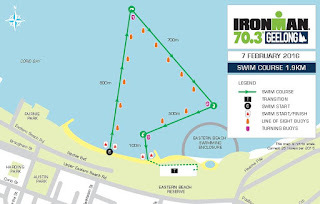 Back onto the foreshore, the course goes past the Ferris wheel and along the left side of transition and the swim enclosure before a short sharp climb up onto Hearne Pde which will test the power in the legs. Once up there competitors must stay on the left hand side path running around 750m along Hearn Pde, up a sharp 250m climb to the turnaround on Limeburners Rd. Staying on the same side of the road as on the way out, athletes run back along Hearne Pde and then up a gradual ascent and then down along the steep path behind the Beach House restaurant. This brings competitors back past transition for the end of lap one. The second lap is the same as the first, and upon the completion of two laps, then its a run up past the Ferris wheel and the finish line again, but this time a sharp right straight out and back along the Pier and then left and a short run to the finishing tape. A very scenic run by the water, a few hills and some flat. 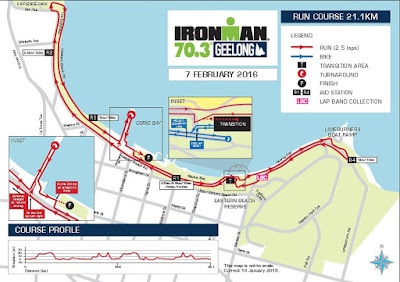 A fair course that will test every runner following a strong bike course. 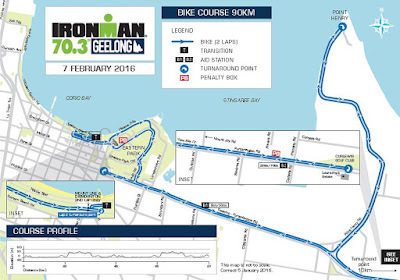 For a run down of the full course including transition and tips on how best to compete the course on race day please come along to the 3 IRONMAN transition tours with Coach Foz at 11:30am, 1:30pm and 3:30pm.